… Jeremy Lichtenstein, who has worked tirelessly with his nonprofit, Kids In Need Distributors to serve children in our community who struggle with food insecurity! Each year Montgomery County strives to honor some of the county’s most outstanding community leaders and dedicated volunteers. This year, Montgomery County has recognized Jeremy’s hard work and extraordinary commitment to Kids In Need Distributors in 2016. 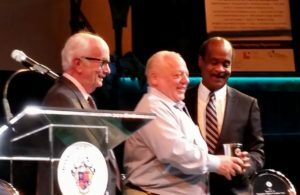 Jeremy proudly received the award from the US Congress and Montgomery County at The Montgomery Serves Awards Gala on Monday April 24, 2017! !